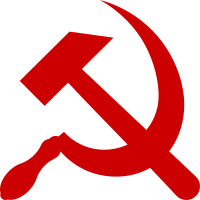 A red hammer and sickle. It was the winner of a competition in 1917, and officially adopted by the Soviet Union in 1923. A sign is something you see (or hear) which means something. A sign may be natural or man-made. A natural sign shows something significant. Leaves turn brown and fall off deciduous trees in the autumn. Temperatures drop, daylight hours shorten. It suggests winter is coming. Many birds migrate and some mammals hibernate in response to natural signs like these. Humans, as usual, are a bit different. They make their own signs. A man-made sign is called a signal or symbol. It is an artificial thing, which people decide means something in their society. For example, the stop sign on the road tells the person that they must stop their car there. So does a red traffic light. They are signals with a legal meaning, and people learn what these meanings are. Sometimes a person may not know what a sign means. Feeling a cold wind could be a sign that someone left a door or window open. In medicine, a sign is something seen, whereas a symptom is something felt, like a pain. A sign might be something like high blood pressure, which can be measured. A road sign or traffic sign is something that gives information by means of a symbol, or in only 1 or 2 words. It helps people in their vehicles on the road. Some signs include: Give way, Stop, Keep left, No U-turn, no parking, Zebra crossing and much more. Signs are very useful. Without signs and traffic lights there would be many accidents and arguments on the road. ↑ "The Hammer and Sickle: the role of symbolism and rituals in the Russian Revolution". Retrieved 3 August 2014. This page was last changed on 3 January 2016, at 11:37.